Back to back algorithm refreshments have brutalized webmaster by making them a bit lazy, and now they have to face yet another nut cracker and this time it is a Panda Algorithm update. 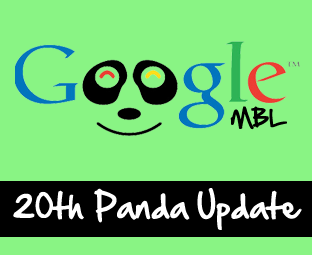 Within a week, two notable refreshments have been rolled out First the EMD (Exact Matched Domains), and now its Panda 20th Algorithm refreshment. According to the Matt Cutts, “Google has begun to refresh its algorithm and it will continue till the weekend”. Looking at the early reports, we assume that it is a key update which affected almost 2.4% of English and 0.5% of non-English queries. Today we will be discus why Panda 20th is a foremost refreshment. After lots of algorithm updates, the effect of panda 20th is at the higher side which affected about 2.4 % of English queries. However, according to our estimated the percentage will be increased when the update would be finished at the end of this week. The majority of bloggers are happy the way this update has behaved because many of them have witnessed a massive traffic flow during the past two days. Following is the screenshot of Matt Cutts Email which he sent to a PRO Blogger confirming about the update. Since, these two algorithm refreshments were rolled out one after another so it’s pretty difficult to understand which updates affect your blog. Google overlap these two updates so Bloggers would keep on thinking which refreshments hurt them either Panda or EMD refresh. However, these two algorithms have no similarities because one fight against spam while author eliminated matched domains. Now you may have been thinking that Panda use to have a version rather than number but this time Danny Sullivan decided to call it from a number. Since, we have 20 updates so we are calling this update Panda # 20. What Happen To The Jolting Penguin? Bloggers and webmasters were expecting that Google’s next algorithm refreshment would be Jolting Penguin, but they surprised everyone by rolling our Back to back Panda 3.9.1 and 3.9.2 updates. Since, the Matt Cutts controversy about Penguin has been down and dusts so you can imagine Penguin refreshment is on its way. Penguins are not that much more deadly, but it’s been more than 2 months since the last refreshment so you can expect a massive explosion. Google is firing these updates more frequent to soak all the juice let in the bloggers and webmasters. Within a week, two updates on a trot would surely test the skills and patience. We should always keep in our mind that perfection comes with time and those who never gives up always wins the every race of life. I am pleased to announce that MBL has finished its 200th Article and now we are ranked under 16k internationally according to the Alexa ranking. Thanks for supporting us till then peace, blessings and happy updating. Well, Things are Getting Hot at the Moment. Google is just concentrating to make their search engine the best among all. Since, Google have lost their Number one Spot so they are trying to get extra attention. Peace and Blessings.